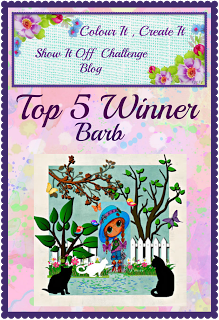 ﻿This is my DT card for the new challenge starting today at the Brown Sugar challenge blog. This theme seems to be a popular one: Anything Goes. The generous sponsor of this challenge is Dr. Digi's House of Stamps where you will find a wonderful selection of various images. I chose to use Gnome Sweet Gnome, thought it would be fun to color and it was. I hope you'll come join in the challenge and share your creations with us, we do enjoy visiting your blogs and gaining new inspiration from you along the way. A new challenge begins today at the Wags 'n Whiskers challenge blog, the theme is: Lets's Be Thankful. I chose the digital image Thinking of You to use on my DT card, she is so sweet looking and of course the cat is adorable. 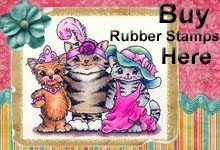 Wag 'n Whiskers has a large variety of images to choose from both digital and rubber. I hope you will come and share your creations with us, we do enjoy visiting all of your blogs gaining inspiration from you along the way. 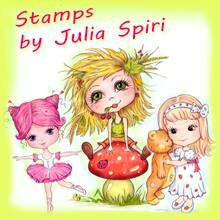 This is Misteri All Dressed UP a digital image from Digis Stamp 4 Joy. Colored with Copics. They have a large selection of images that are lovely to work with. I added some sparkle and bling to jewelry. This is my DT project for the new challenge at Crafting for all Seasons, the theme is Tag It. Our generous sponsor for this challenge is Bugaboo Stamps and they have such a huge variety of wonderful images to choose from. I chose to use Jesse Moon for my tag as she is just too adorable for words. She, the ribbon and her background are colored with Copics. The blue tag behind the embossed one was made by a spill of blue Distress acrylic paint, first panic sets in, then I see my package of tags just sitting there, so yes, I used my brand new tags to swipe the paint up from my craft sheet. Over time they are becoming quite useful. I hope you will come and join us sharing your creations and you may be the lucky winner this time round. 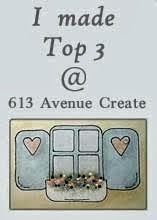 This is my DT card for the new Crafty Creations Challenge and this time it is: Brad, Buttons and Bows. 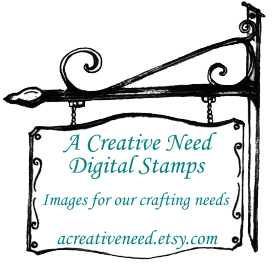 Our generous sponsor for this challenge is: A Creative Need Digital Art Stamps where you'll find a wonderful collection of images and papers to choose from. I'm using 3 of their images on this card, the glass holding the pencils sitting on the paper, stack of envelopes and the bow. The dragonfly is a brad as well as the 3 I've glued on the written paper, the bow is paper, the buttons are the little heart shaped ones, coloring was done using my Copics. I hope you'll come join us and share your creations with us, we all enjoy visiting your blogs and gaining more inspiration along the way. Today's new challenge at Incy Wincy is Buttons and Bling. 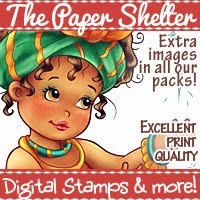 Our generous sponsor for this week is The Paper Shelter where you can find beautiful images and papers to choose from. I choose to use the image Moon Spell, for my DT card, she does come with her own background paper. I made my own background on watercolor papers using various colors of Viva's Inka Gold. Colored her with Copics, used 2 heart shaped buttons with bling for the flower centers. I hope you'll come join us and share your creations as we enjoy visiting your blogs and gaining more inspiration along the way. Good morning I hope everyone is enjoying their weekend. 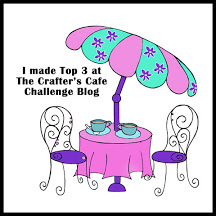 Today is the start of a new challenge at the Lacy Sunshine Challenge Blog. The theme is Feature a Hat and I really like this little fellow so I chose to use him for my DT card Harry Boo's Christmas Tree and he's wearing a cool hat, well, I think so. He is just one of the charming characters amongst many you can find in a digital image or rubber at the Lacy Sunshine A Crafter's Candy Shoppe. 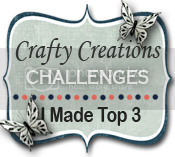 I hope you will come join the challenge sharing your creations with us. The members of the DT enjoy visiting your blogs and gaining inspiration along the way. CUTE - love working with all the cute images and it makes me smile and hopefully others as well. Hello, it's Sunday this means there is a new challenge at the Come And Get It. challenge blog. This week the theme is a Recipe: Using a Die, Bling, Designer Paper and Ribbon. I chose to use Eleanor and Pickles Snowboarding, for my DT card, I just love these 2 little characters. They are from the Lacy Sunshine A Crafter's Candy Shoppe and it truly is with so many charming characters to choose from. Lacy Sunshine is the sponsor for this week's challenge and it just may be your lucky week to win some of her wonderful images. 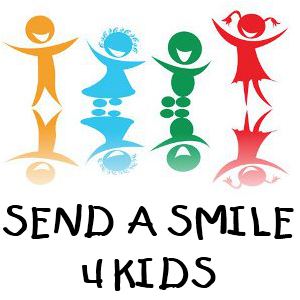 I hope you will come and join us in this challenge and share your creations with us. The DT members enjoy visiting your blogs and gaining more inspiration along the way. 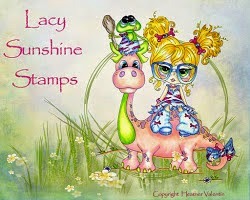 This is Macy Boo from the Lacy Sunshine Shop, colored with Copics, few dies added with some glitter and gems. This was a fun card to make, not much coloring but lots of stamping with stamps from my old stash. 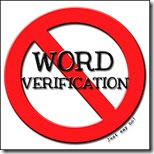 It's Monday this means a new challenge begins at the Incy Wincy Challenge Blog. This week it's a Sketch. Lacy Sunshine, A Crafter's Candy Shoppe is the sponsor for this challenge. There is a large variety of charming characters digital or rubber to choose from. 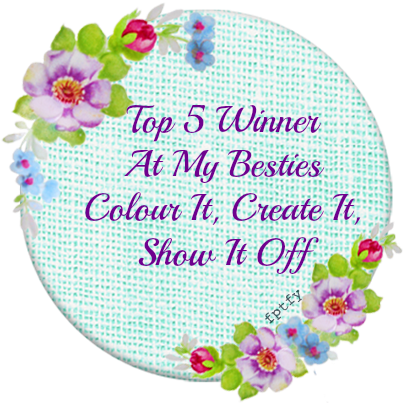 I hope you'll come join us sharing your creations and you may be the lucky winner this week. 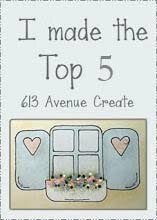 This is my DT card for the new challenge at Come And Get It , the theme this week is A Card for a Child. Eureka Rubber Stamps is sponsoring this challenge, I chose to use the digital image Tea Time. They do have a large variety of images both digital and rubber. I hope you'll come join us sharing your creations with us. Today is the beginning of a new challenge at the Brown Sugar Challenge Blog, the theme this time is Bows and Buttons. The bow is on Rory's hat and the button on the ribbon. 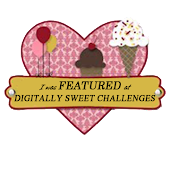 We have a wonderful sponsor for this challenge it is Lacy Sunshine, A Crafter's Candy Shoppe where you can find an amazing selection of a variety of charming characters. The image I've used for my DT card is Rory's Giant Pumpkin, she is one of my favourite characters but I do have many favourites. I hope you will come sharing your creations with us and see what the rest of the DT have created. Maybe you may be one of the lucky winners this week. Today at Wags 'n Whiskers it is the beginning of a new challenge and this time the theme is Stripes. I've chosen to use Magical Friends for my DT card, they just make such an adorable couple and were too fun to color. My stripes are from a First Edition, Summer Breeze design 6"x6" paper pad. 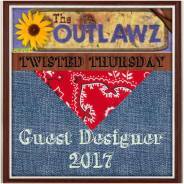 I hope you will come and join us in this challenge sharing your creations and see what the other design team members have created. We also enjoy visiting your blogs and gaining new inspiration along the way. Today begins a new challenge with a new theme at Crafting for all Seasons this one is Buttons and Bows. The Paper Shelter is the generous sponsor for this challenge and they have some beautiful images and papers to choose from. I chose Autumn Attitude to use on my DT card which I thought to be appropriate for this time of year and she has such a darling face. I hope you'll come join us sharing your creations and seeing what the other members of the design team have created. Today is the start of a new challenge at the Crafty Creations Blog, with an easy fun theme: Thinking of You. 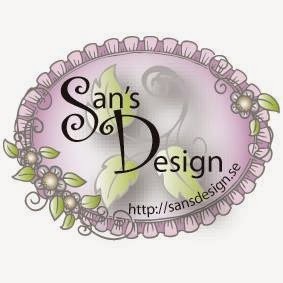 Our generous sponsor for this challenge is San's Design. It's Monday so that means the start of a new challenge at Incy Wincy, this week we're playing Bingo. For my DT card I chose the middle row using Perfect Sunday by Dr Digi's House of Stamps. 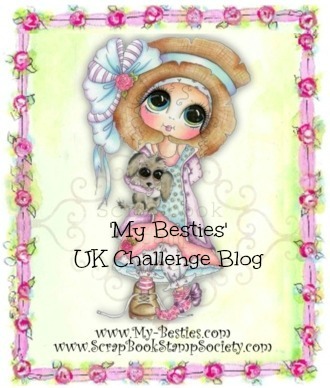 Dr Digi's House of Stamps is our sponsor for this weeks challenge. What a fantastic assortment of images to choose from, well worth your time to visit the online shop. 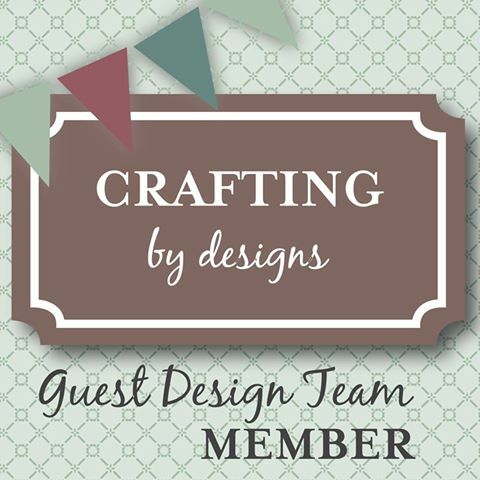 I hope you'll come join in our challenge and share your creation with us as the design team are delighted to visit your blogs and getting inspiration. A new challenge begins at the Lacy Sunshine Challenge Blog today and the theme for this one is Halloween, too fun. I'm using Bashful Boo Trick or Treat for my DT card, I think that little face is so sweet. I hope you'll come join in the challenge sharing your creations with us. 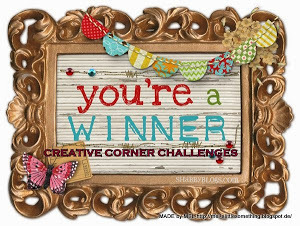 You may be one of the lucky winners who gets to choose digital image or images from Lacy Sunshine , A Crafter's Candy Shoppe. There are so many wonderful little characters of all types to choose from. Sunday and the start of a new challenge at Come And Get It , the theme for this week is Girls and or Women Having Fun. 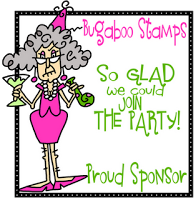 Our sponsor is Bugaboo Stamps what a fabulous selection of images they have at their online store. I chose to have fun with JJ Drinks Well with Others, she just made me smile. I hope you'll come and join in the challenge sharing your creations with us. 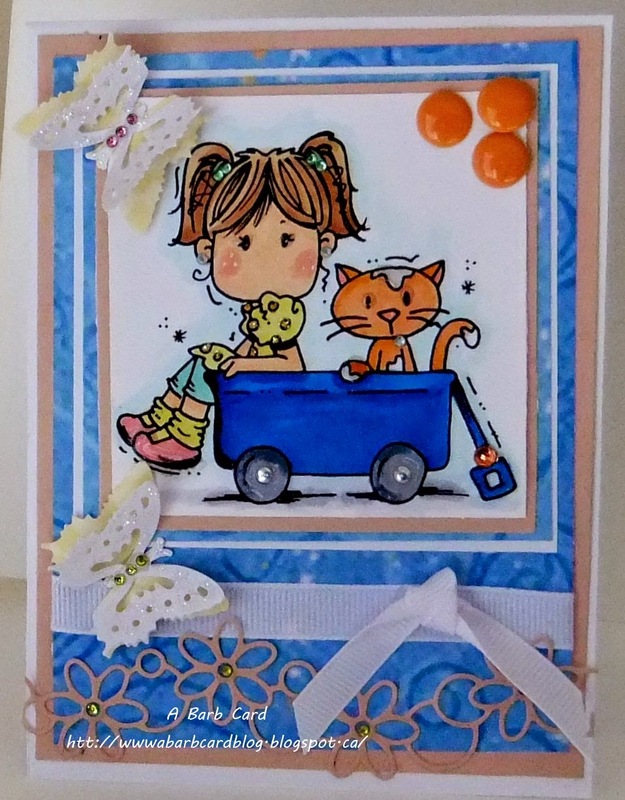 This is Girl in Kitty Wagon, a digital image from Bugaboo Stamps. That I will enter in the Bugaboo Challenge with the theme being Anything Goes and the blog being called Catch the Bug. This is Lilith, a P Pinky Doll and they are just too adorable for words with a wonderful selection to choose from. Colored with Copics was just too fun for me. She stands so well on her own I didn't need to add much more than her image but I did add my new dragonfly and flowers. 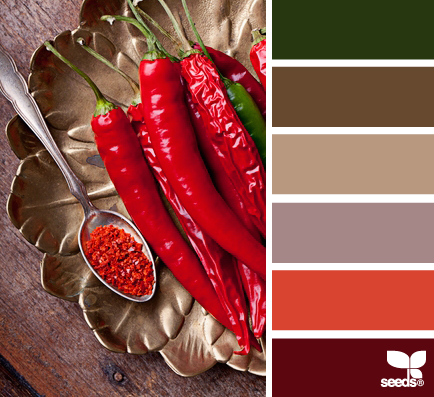 It's Monday this means a new challenge begins at Incy Wincy, this week it's a color theme, you'll find the colors for this challenge in the picture with peppers. We have an excellent sponsor for this challenge A Day For Daisies. 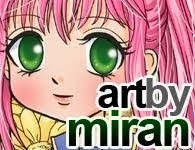 They have a wonderful selection of images and usually a freebie for you to pick up at their online shop. 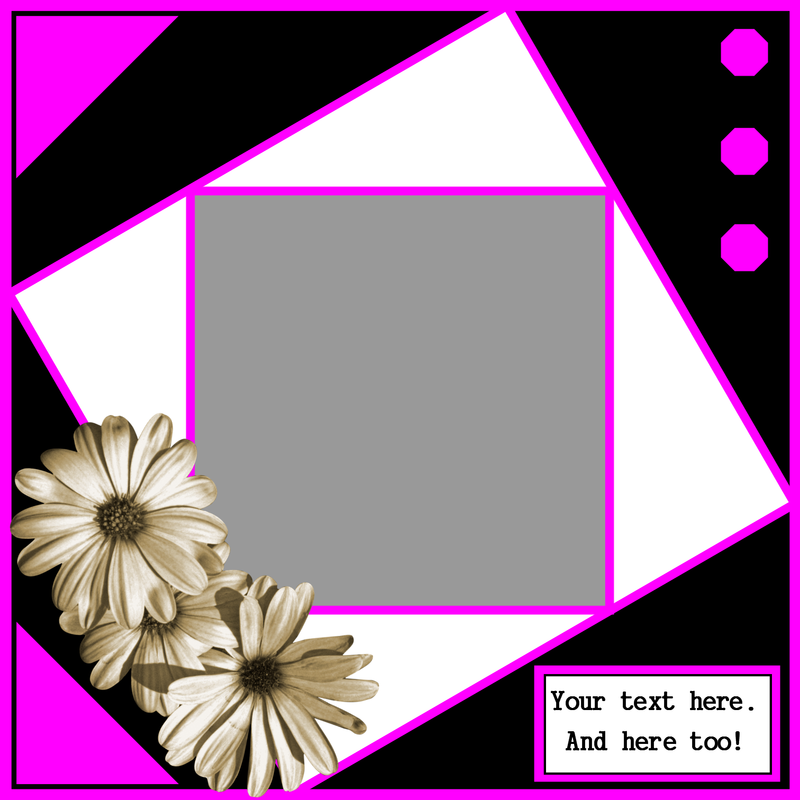 This is my DT card for the challenge, the image is one of A Day for Daisies freebies that I've had for a very long time and thought it would be perfect for these colors. She is also one of my favourites so I don't know what took me so long to color her. I don't know what she is called as I said she's been with me for a very long time and I didn't write it with the image. I hope you'll come join in the challenge and share your creations with us and then we can go get some inspiration from visiting your blogs. 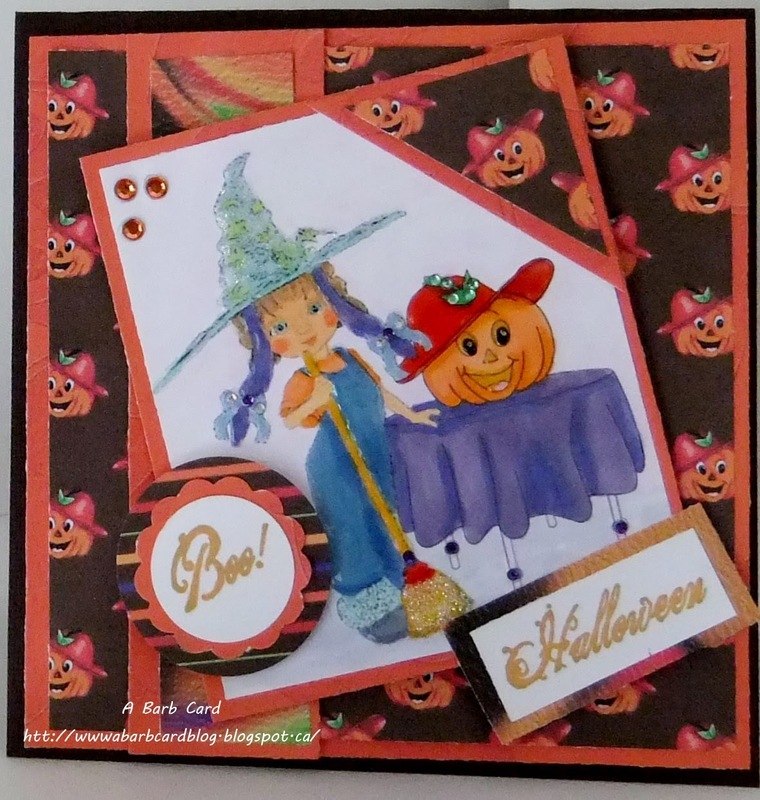 This is my DT card for the start of a new challenge today at Come And Get It with the theme being Halloween. This was a fun a card to do, I did go a little over board with the stickles forgetting it doesn't do well in the picture when posting. QKR Stampede is our sponsor for this challenge and they have a wonderful selection of images to choose from. I chose to use Hiding and the little Witch in the moon, I couldn't resist that darling little face on that dog. I hope you'll come over and join in the challenge sharing your creations with us. Today is the beginning of a new challenge at the Brown Sugar Challenge Blog. 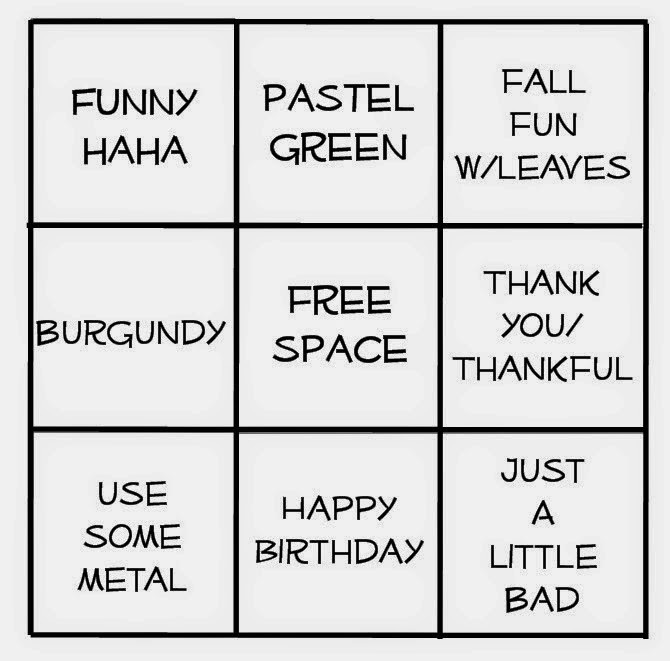 The theme this week is Happy Fall, this can be a fun one with all the colors of Autumn around with the leaves changing for inspiration. 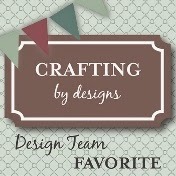 I hope you'll come join us sharing your creations and you may like to see what the other DT members have come up with. Today is the start of a new challenge at the Wags 'n Whiskers Challenge Blog with the theme being Fall Colors. For those of us enjoying the Autumn season we are surrounded with inspiration from nature with all the leaves changing their colors. 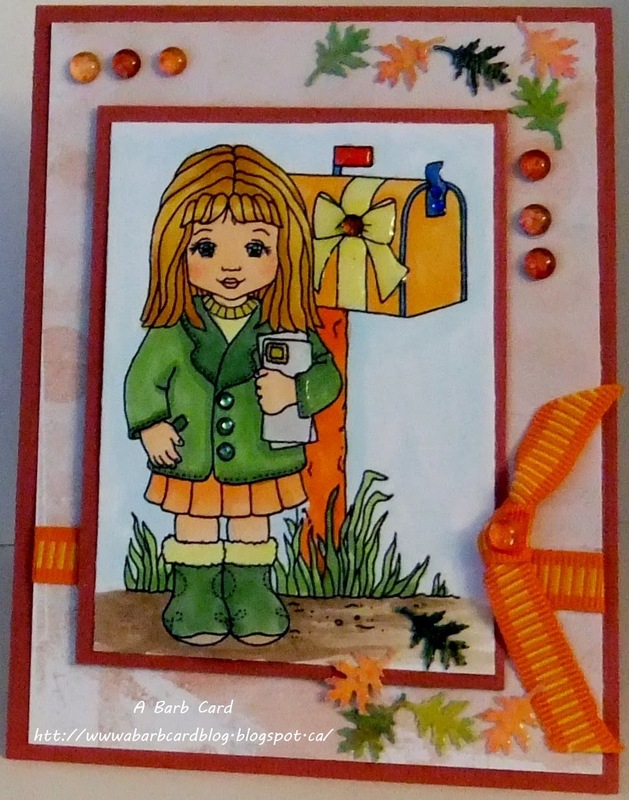 I chose to use With Love for my DT card for this challenge as I could picture her wearing fall colors and she is so adorable. Wags 'n Whiskers images come in both digital and rubber which you can purchase here if you live in the USA or Canada or here if you live in the UK/Europe or the rest of the world. I hope you will come and share your creations with us and see what the other design team members have created. I hope everyone is enjoying Autumn with all the pretty colors of leaves changing. This is my DT card for the new challenge at Crafting for all Seasons that begins today with the theme: Too Cute To Spook. I hope you'll come and share your creations with us and see the creations of the other DT members. We have a wonderful sponsor for this challenge Stitchy Bear's Digi Outlet where you will find so many images and paper packs and from various artists. 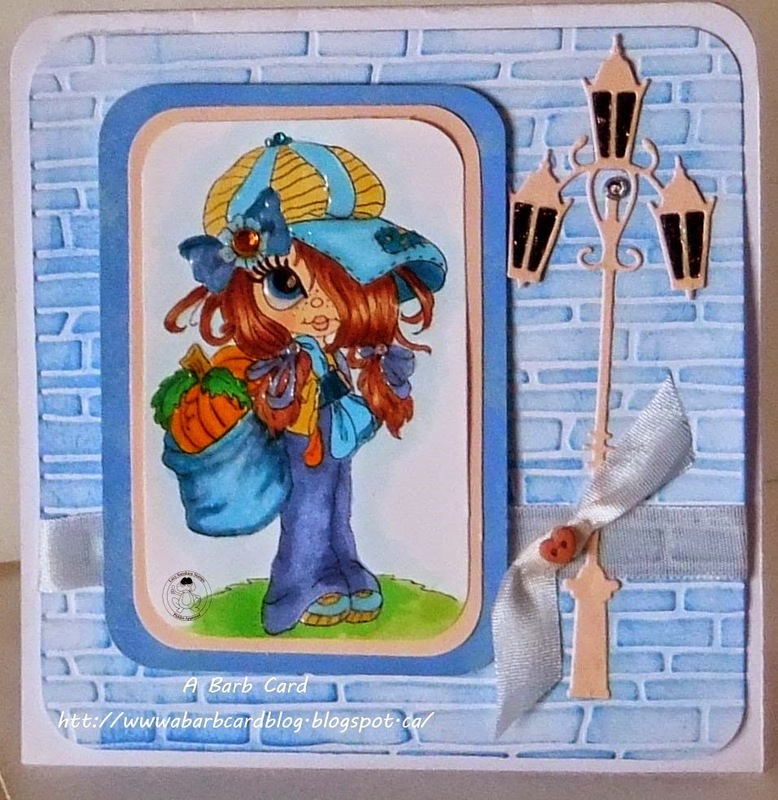 I've chosen 2 images for my DT card, New Hat and Red Hat Lady Pumpkin pack and both were fun to work with. The background paper is a part of the pack which comes with the image and four different design papers. Supplies used: Copics, Glossy Accents, gems, EK Success Punches and the sentiments are from CTMH.